Maggie Valley is the central hub for great motorcycle rides here in the Blue Ridge and Smoky Mountains of Western North Carolina and Eastern Tennessee. 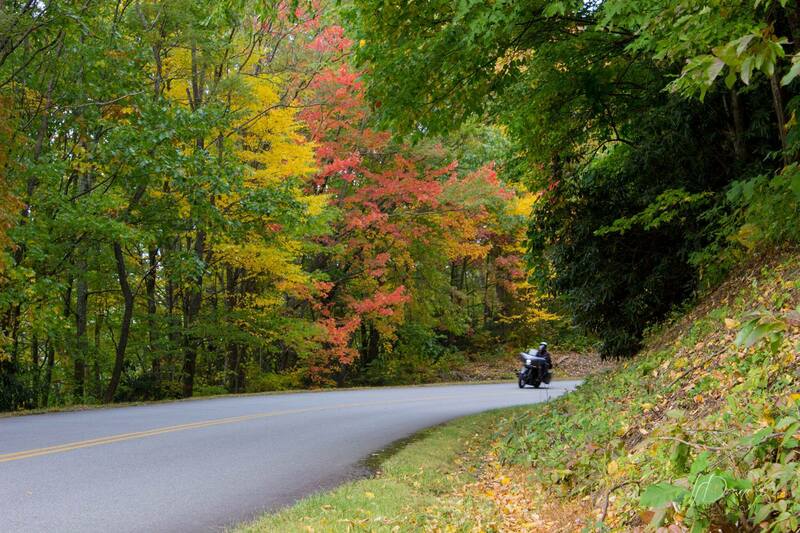 Each year, the twisty and curvy mountain roads surrounding Maggie Valley attract thousands of Motorcycle enthusiasts each year. All of them come to not only stay and play in Maggie Valley, but to ride the famous motorcycle rides, with names the “The Dragon” and the “Rattler”. With the miles and miles of mountain roads around Maggie Valley, the hardest part is finding nearby fun and exciting roads, with curves, and scenic views, but that are safe as well. Our list of top Maggie Valley motorcycle rides will provide days of excitement. Whether you’re on a two-wheeler, three-wheeler or even in your car, the rides below will provide the exciting and thrilling outdoor adventure you’re looking for. Now grab your gear, fire up that bike, and let’s get riding! One of the "must do" rides in Western NC, this ride was once a run for moonshiners. This ride is full of curves, mountain vistas, waterfalls and secluded lakes. Probably the most famous ride in Western NC, this ride is a "must do" while visiting the Maggie Valley area. "The Dragon" is 90 miles of curves, scenic views, and road side attractions. Traveling through Pisgah National Forest just outside, Hot Springs, NC, The Rattler twists and turns all the way to Lake Junaluska, NC. Wear Personal Protective Gear – Those tight turns and curves can provide one heck of a road rash if go down. Always use proper lane placement. Slow down and take your time – Did you know that the mountains have a high percentage of motorcycle accidents. Why? Due to out of town bikers, and inexperience on mountain roads. If you’re inexperienced, take your time and slow down. Use the right brakes – When going downhill, use less of your rear brake, and more of your front. Do the opposite going uphill. This will help prevent your bike from skidding from out under you. Avoid the clutch when stalling – In tight hairpin turns, always go faster than your stall speed, and avoid using the clutch if possible. The clutch will just make you roll backwards. If you’re going to stall, just, steer to the side of the road, hit the rear brake, and let it stall. Stalling with the rear brake on is better than rolling backwards. Keep a full tank – In the mountains, there are often very long distances between gas stations. This is particularly true not the Blue Ridge Parkway. Take a break, and fill that tank up when you can. Bring rain gear – Weather in the mountains is never predictable, and rain can often just suddenly show up when you least expect it. Bring along some rain gear, just in case. Don’t rely on your cell phone –Cell service in the mountains is spotty, and when in a remote location or up high, it would be safe to assume you won’t have service. Print out riding directions or instructions, or use a GPS Device. Safe riding! Be sure and share your ride photos with us in our Facebook Group!